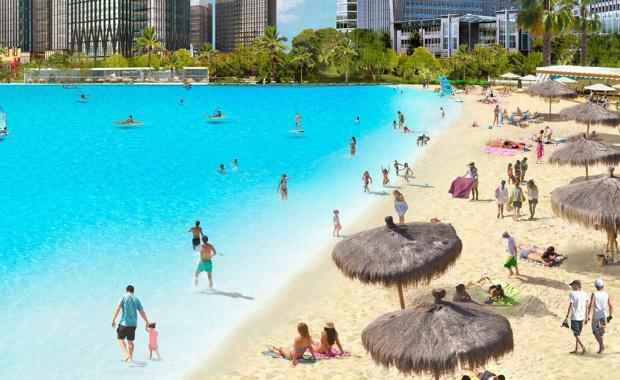 Lagoon building company Crystal Lagoons has been appointed to oversee the development of a major new attraction at Steve Wynn's proposed "Wynn Paradise Park" on Las Vegas Boulevard in the United States. The lagoon, which is still only in the planning stage, will replace part of the Wynn Golf Course, enabling guests to enjoy a variety of water sports including swimming, sailing and paddle boarding. The lagoon will be the biggest in the United States, and will feature Crystal Lagoons state of the art technology, a sky gondola system connecting the hotel to an island, nightly fireworks and water sports events, a new 1,000 room hotel, convention centre and shopping, that will bring a unique experience for its visitors. This development reflects Crystal Lagoons continued worldwide growth, with 13 announced projects this past year, and an additional 44 in different stages of negotiation with an estimated total investment of US$ 53.4 billion. Uri Man, CEO of Crystal Lagoons said the alliance with Wynn's represented a huge opportunity for the company. Wynn’s other famous resorts include the Bellagio, The Mirage, The Golden Nugget and Treasure Island. "The Crystal Lagoons project in Las Vegas will make the company’s dream come true. From the very beginning, founder Fernando Fischmann dreamt about bringing large bodies of crystalline water to the world’s entertainment and luxury capitals, such as Dubai and Las Vegas”. Fernando Fischmann, which has developed a patent-protected technology that allows the construction and maintenance of unlimited-size crystal clear lagoons at very low costs.